I love Bigleaf Hydrangeas (H. macrophylla), the traditional garden Hydrangea with either big mophead flowers or the subtler lacecap flowerheads. Most gardens have a Hydrangea or two tucked in, and why not? As long as they have composty soil and get watered regularly, they make a fantastic show of blooms with very little effort on our part. It’s coming up on the time of year to prune them in warmer climates where it doesn’t snow (right after they finish blooming is best), and I made a video and took some photos to show you how (if you live in a colder climate, you use the same technique to prune, only you’d do it in mid-spring to protect against frost damage). Why prune? 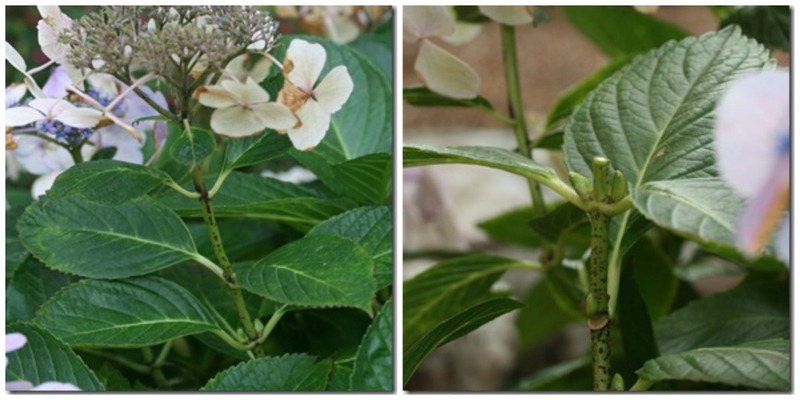 Scientific studies have shown that Hydrangeas that are pruned properly flower more than plants that are left unpruned. Pruning also encourages a fuller habit for the shrub and stimulates the new growth that keeps the plant healthy. When you are ready to prune off your dead flowerheads, look along the stem for a pair of swollen buds at the base of each leaf. The first set of leaves below the flower rarely has these swollen buds, but often the second and third pair of leaves do. Prune off every dead flowerhead to just above these swollen buds, taking care to leave the buds unharmed when you cut. Once you’ve cut off every dead flower to a part of the stem that has these swollen buds, stand back from the shrub and notice whether there are any shoots sticking up above the rest of the plant. Feel free to prune any of the other, non-flowered shoots to their own sets of swollen buds to give the plant an even, rounded shape. After you’ve pruned the entire shrub in this way, you can look inside the shrub to see if you want to remove any of the oldest branches which are least likely to flower. If you remove one quarter of the oldest, woodiest branches each year by pruning them out as far down as you can, it keeps the plant rejuvenated and ready to put out fresh young stems which will flower more for you. You can also prune out any stems that are so spindly they wouldn’t hold up a flower, and any stems that are dead with no leaves. I love to do this kind of regenerative pruning at the end of the summer when you can still see what stems are alive. Once the plant loses its leaves for winter, it’s harder to tell what’s dead. So true, Michael!! If you’ve found this pruning tutorial helpful, check out my articles on how to prune Scotch Heather, which is also finishing up its bloom now, Alstroemeria, and Hardy Cranesbills/ Hardy Geraniums. Would it be rude of me to email a link to the video to my landlord? She had a great garden planted around the building, but she neglects it and didn’t prune her hydrangea plants at all last year. They are very ratty looking (and the remnants of LAST year’s dead flower heads are still on the plant). .-= Fern @ Life on the Balcony´s last blog ..Flickr Group: Post a Photo of Your Fall Container Garden =-. Sheesh – you ought to see if she’ll let you do a spot of pruning in return for a discount on your rent!! So sad to see last year’s dead flowerheads clinging on still. Nothing says “I’m unloved” like an untended garden. I think deadheading is a joy to do! .-= Pomona Belvedere´s last blog ..Sagebrush (Artemesia tridentata) =-. Thank you, Pomona!! The deer are terrible this time of year. Hydrangeas are one of my most cherished shrubs. One of my most unusual is shooting star hydrangea(Hydrangea macrophylla ‘Hanabi’) I bought it at a little market for 2 bucks and it is such a trooper. Thanks for such informative tutorial. I am going to print this up so that I can reference it later. .-= chloe´s last blog ..Dee Vine Design =-. Chloe, I absolutely LOVE the shooting star Hydrangea. I definitely want one in my own garden – they really are quite special. What a great tutorial. The Felco’s are in hand and the hydrangeas are safe from what would have been my poor pruning techiques. Thanks! thanks for this informative video…it really helps! Thanks so much for the timely tutorial. I neglected my hydrangea for several years, and cut it back quite severely this spring. No blooms this year, but I’m hoping for a great season next year. I have one hydrangea that is getting way too big for its location, and it is too big to consider transplanting. Can I cut it way back in the fall (to 2/3 it’s present size) without ruining it??? I so wish that I had read this before I pruned mine. I have oak leaf and lime light. I got a little carried away. I hope I have blooms this summer , but am skeptical. 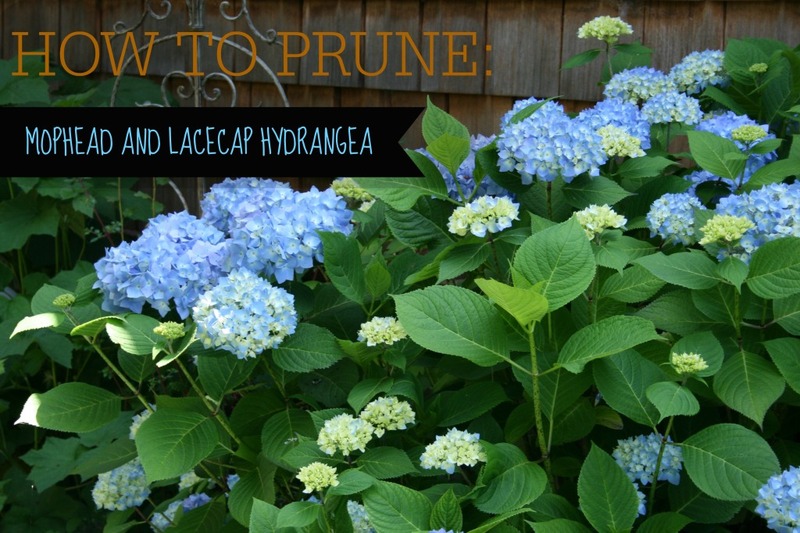 Thank you so much for the tutorial on pruning hydrangeas, one of my favorite plants. I live in Arcata and am wondering if you would be available to help me with a landscaping project at my home. A friend recently referred me to you. Great information on the mopheads. I was wondering if you had a video about cityline varieties, I read that they only bloom on old wood. I wondered if there is any pruning at all they would benefit from since my understanding is they should not be pruned?